If you are like us and still have enough Easter candy left over to cause a mouth full of cavities, you proabalby aren't excited about buying a giant candy filled pinata for Cinco de Mayo. You can make a mianature versin for your guests and fill them with their personal favorites using this tutorial from One Charming Party. 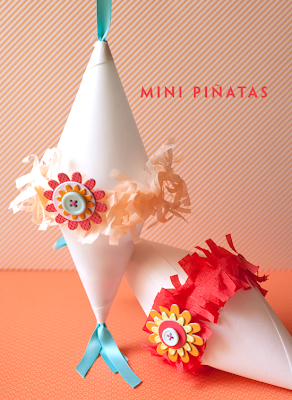 We have a birthay in our house on May 5th, so I might try to find some gifts that I could hide inside these mini pinatas. Maybe some cold hard birthday cash. Thanks for featuring these! I think I need one or two badly!!! Thee are the cutest things!!! Squeal! these are too cute, what fun!